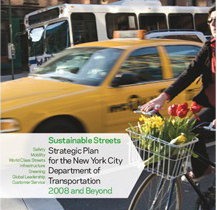 In the Spring of 2008, DOT released Sustainable Streets, the agency's strategic plan. The plan laid out, for the first time ever, a clear and detailed transportation policy for New York City—one that promised a new direction. DOT is delivering on the promises of its plan, and is moving forward on every one of the 164 actions committed to in Sustainable Streets. This annual update of the plan reports on that progress, and serves as a focal point for meeting targets and sustaining momentum across all of our Agency’s programs. It also sets forth new goals that have emerged during the past year, ranging from development of an internal DOT car-sharing system to further reduce DOT’s fleet, parking needs and miles driven, to issuing a request for proposals to establish a large scale public bicycle system in New York, similar to those in Paris and other cities. Launched and expanded large-scale targeted safety programs—Safe Streets for Seniors and School Safety. Implemented complete-street roadway designs in many locations, including an award winning design for Ninth Avenue. Safety benefits have been demonstrable within months in many cases. Developed and launched the Green Light for Midtown plan to reduce traffic congestion in the heart of Midtown Manhattan and improve safety and public space in Herald and Times Squares. Launched the Select Bus Service program with NYC Transit, implementing routes on Fordham Road in the Bronx and 34th Street in Manhattan. In 2008, implemented a record 90 miles of new bicycle lanes, contributing to an unprecedented 35% single-year increase in bicycle commuting. Created new public spaces in key city locations, including Madison Square, the DUMBO Manhattan Bridge arch, the Bronx Hub, Gansevoort Street and others. Launched DOT’s Public Plaza program and application process to create new open spaces in every NYC community. Announced the program’s first 9 sites. Launched the Summer Streets program that opened Park Avenue and connecting routes to pedestrians, cyclists and others on August Saturdays. Reduced parking placards for DOT by 20% and DOT’s light duty vehicle fleet by 10%. Established a clear, cutting-edge direction in sustainable transportation policy with publication of World Class Streets, Sustainable Streets Index and NYC Street Design Manual.